Anyone ever heard of a laundry closet that also serves as an office space? If not, now you have! My laundry closet also serves as our office space. Since we don’t have space for a separate office, we use our kitchen table for work and family meals. All of our office supplies and many of my kitchen supplies are creatively stored in my laundry closet (and hidden from sight when needed!). As a Pro- Organizer, I see many people who don’t maximize the space in their laundry closets or rooms. I often suggest that they think about adding vertical storage and side storage. By adding a few shelves and hooks, you can multiply your storage capacity! My awesome hubby removed the single wire shelf that came with the house and added three shelves in graded lengths. The fact that I can use the top of my washer and dryer for storage is pretty nice. I use the top to store a large blue box of kids crafts and coloring items. The second small blue box stores all of our pens, scissors, and small items we use on a daily basis. I try to follow what I preach and label everything. That messy black wicker box is my husbands; hence, it’s almost always messy but it contains his random stuff! I also made sure to add a power strip as a charging station for many of our electronics. Our laundry detergent and dryer sheets are out for easy access. I use the white trash can to hold dirty dish towels. The first shelf holds many of our smaller office supplies in the black and white totes. My “command center” (which I talk about on this video blog) is to the right of those totes. It’s very accessible and used on daily basis. My three ring binders and books are stored beside it in a black shelf divider. On the second shelf, I have items stored and stacked for quick retrieval and my husband’s school book area is to the far right. I also added a hook for him to hang his backpack. To the left, I have our boys coloring books, workbooks, scrap paper, and stickers stored in another black shelf divider. Up above on the second shelf I store kitchen appliances that I use weekly, a box of smaller kitchen items that I use infrequently, and my laundry detergent supplies in the small blue tote. You can see that I use the very top shelf for appliances that I don’t use very often. The key to this area is that everything is visible and labeled if needed. I LOVE this closet and it makes working from a kitchen table possible and easy. Last week I shared my living room– Next post will be another space in my home! 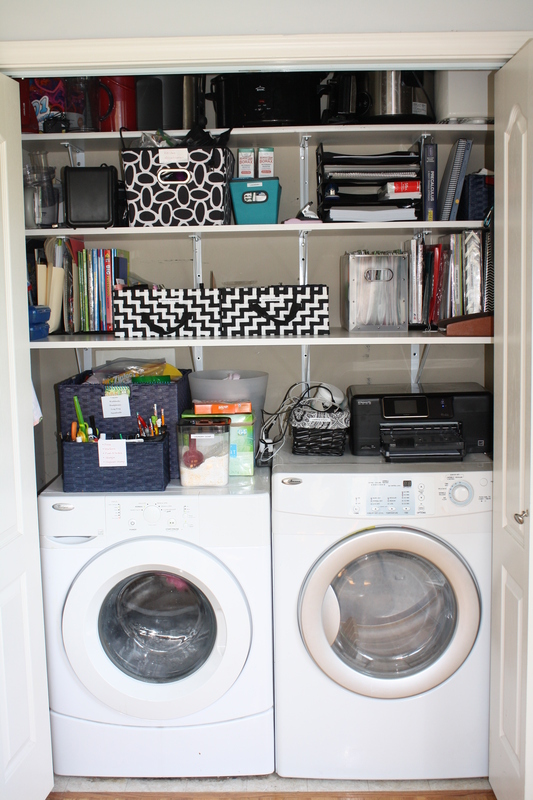 What are your laundry room storage tricks??? You have a awesome site over here. I just wanna thank you for all the interesting information on it. I’ll follow your website if you keep up the good work!